All is good. Having a ball actually. In the lead up to the shoot I got really nervous, which left me with no real perspective on the film at all. I had been quite calm in the months and weeks leading up to the shoot, dare I say even enjoying myself. But a few days before the shoot, it seemed like such a daunting task. This is my first feature film and I'm leading my cast and crew on a 5000km journey through the deserts of South Australia. So much to think about and work through, so many questions, not enough answers... But now at the end of week one (of six) it's feeling great. I'm just beginning to find a rhythm and also learning what my role really is as a director, other than dreaming up the dreams and working with the actors. Talk about learning on the job. I've never shot so much, so quickly. But I'm feeling good about what we are creating and what the film is becoming. I guess this first week has been about trying to find a style and approach that works within the massive time and especially stock restraints I have (I have an official shooting ration of 1:12, which is kind of just enough, but as I wanted to shoot on 35mm this is what it has to be... and on Tuesday we shot close to 1:40 of which I was subtly reminded by Nick and Antonia (Producers) that some wildlife documentarians may not shoot as high as that...). So Greig and I are trying to establish a shooting style where we can shoot minimum coverage, with minimum takes but still find an interesting approach without stitching Jack up in the edit. It's quite a weird feeling shooting this story finally. I've been with this film for almost four years now and there are some images and scenes burnt into my mind since the first time I read the script. So it's very cool seeing these characters and images literally come to life. The scary thing is when the time comes to shoot that image or that scene I have 45 minutes or so to do the whole scene. Which means nailing everything with that minimum coverage and with 1 or 2 takes. Scary, but invigorating. Alot of the morre dialogue heavy scenes (of whcih there are not that many in the film) we have covered as long takes with no cutaways or coverage. Which puts the onus on the Hugo and Tom to get it right in the performance. Kiind of feels the way it should be. Last night Hugo had to hack all his hair and beard off with a pair of scissors. We only had one take obviously, and that take is one of the most mesmerising things I have seen. Intense, scary and beautiful. There have been a couple of shots where we have only had one take, and I really love shooting that way. The scene is charged with a very special energy. I love the fact that everyone, cast and crew have to hit the right notes. If anything I think it actually relaxes everyone as they know that whatever happens, happens and they know that they will not be standing around doing multiple takes. Tom the 10 year old boy is constantly surprising me. As a young boy he is incredibly focused and present even more than I hoped he could be. On screen he delivers above and beyond what we would have ever expected. The other night we shot through till 2am, and even though he was really tired. Like falling asleep on the spot tired, he delivered. He had to sit at a table in a fast food resturant and vomit (an idea I introduced to the scene late that day...). Again one take, one mouthful of chicken and vegie soup and he nailed it. Perhaps the best vomit performance I have seen, and being the father of 2 young kids I've seen a bit of good vom action. It's a big relief to know he can bring the character to life and do it under such pressure. On the flip side, one of the first scenes we shot involved Tom out hunting rabbits. We had a 'animal guy' go out and catch us six proper wild rabbits to use in the scene. They arrived in a animal cage etc. and left in the spot out in the feild where we were going to use them for the shots. When we arrived to shoot. Five of the rabbits had chewed their way through the plastic cage and escaped. Leaving one very scared and stressed little bunny who couldnt do what we wanted it to do anyway. Kids and Animals? Shooting is a battle against time, money and the elements (90% of our film is exterior! Hello Winter!). Working with Greig (DOP) is the dream you'd think it be. As is working with Jo Ford (Prod Design) and Hugo W (Agent Smith). Infact I know the whole crew is fantastic, and I know I have the right army by my side to fight the good fight so the film keeps moving forward in the best possible way. ps: The images aboved are for the geeks. 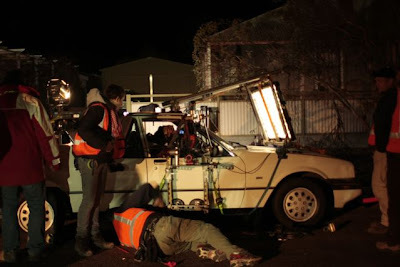 A car rig designed by Skull (Grip) including an A-frame set up, no low-loader on this shoot. Also note Greigs lighting set up. If you need proof that we are working on a tight budget, every light you see has been bought from Bunnings and modified by Greig and Ari in his hotel room. Christmas lights, poly and gaff tape, thats how we roll on Last Ride! 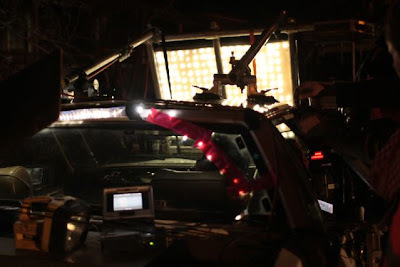 Infact we are using very few film lights on the shoot. Everything is available from your local electrical outlet. And it looks SO good because of it!